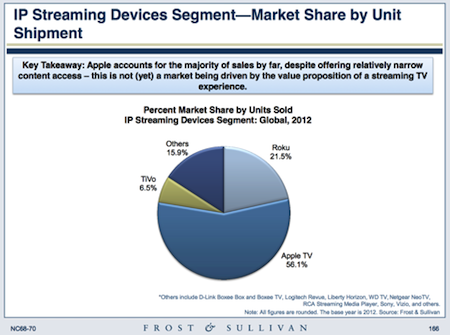 Apple retains the majority of the video streaming devices market, according to the latest Frost & Sullivan study analyzing the size of the consumer video market. The study details the market drivers, product and pricing trends and market forecast for the next five years. It found that Apple, which leads the market in terms of sales numbers, also represented 56% of the streaming device market last year. According to Tim Cook, Apple has sold over 13 million, with half of those in the last year alone. One of the factors of Apple’s success is the Apple TV’s Airplay feature which simplifies the process of transferring a laptop and tablet display to a TV screen. 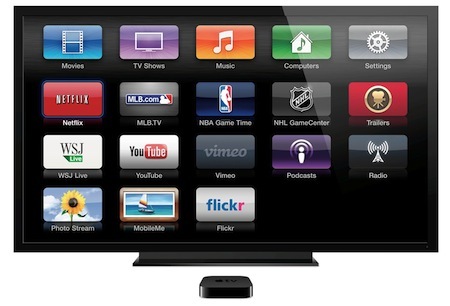 Roku seconds Apple in the domain of streaming devices. 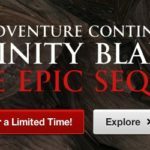 Its growth factor is the strong lineup of content and a series of agreements with Time Warner Cable-like partners. Yet, the market research company questions the long-term potential of Roku. As the Frost & Sullivan study points out, only Apple and Roku have surpassed the one million unit mark in annual shipments. These devices today are predominantly sold in retail stores to users who seek a convenient, compact device to find and display OTT video (subscription or free) to their television screen. Up until 2012 the market has struggled to find mainstream momentum; even today, we believe only two vendors (Apple and Roku) have crossed the 1M unit mark in annual shipments. Aside from Apple and Roku, TiVo offer the next strongest installed base of users, making them a strategic option for Pay TV service providers looking to establish an IP streaming device partnership. Unfortunately for Google, the devices based on the Google TV platform fell below expectations and below the milestone of one million installed devices. As for the Apple TV, it turns out the company really is focusing on improving the overall experience of how we watch television, as recent rumours have suggested. The company is in intense talks with cable and television companies. Jessica Lessin’s sources report that an ad-skipping feature was unveiled during the talks.